Byron Katie: Doing The Work and Awakening to Joy. In 1986, at the bottom of a ten-year spiral into depression, Byron Katie woke up one morning to a state of constant joy that has never left her. She realized that when she believed her stressful thoughts, she suffered, but that when she questioned them, that suffering gave way to truth and then joy, and that this is true for every human being. Over a period of years, she distilled her simple yet powerful process of inquiry into what is now called The Work; four questions and a set of turnarounds that let you see and step into a new reality that exists beyond suffering. One that allows you to become free. 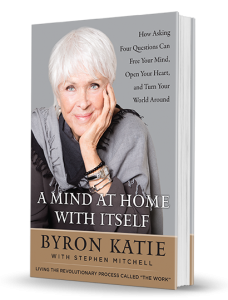 In this in-depth conversation, Byron Katie is joined by her husband, scholar and bestselling author, Stephen Mitchell, to explore her journey and also dive into their newest collaboration, a book on the seminal Buddhist text, The Diamond Sutra entitled A Mind at Home with Itself. RXBAR Kids is a snack bar made with high-quality, real ingredients designed specifically for kids. It contains 7 grams of protein and has zero added sugar and no gluten, soy or dairy. Find at Target stores OR for 25% off your first order, visit RXBAR.com/goodlife. Audible has the best audiobook performances, the largest library, and the most exclusive content. Learn more, start your 30-day trial and get your first Audible book free, go to Audible.com/goodlife.